Since 2011, ILRI and its partners in the public, private and non-profit sectors have pursued a comprehensive research agenda aimed at designing, developing and implementing market mediated index-based insurance to protect livestock keepers from drought related asset losses, particularly those in the drought prone Arid and Semi-Arid Lands (ASALs). For pastoralists whose livelihoods rely solely or partly on livestock, the resulting high livestock mortality rate has devastating effects on asset levels, rendering them among the most vulnerable populations in Kenya and Ethiopia. Index-based insurance represents an exciting innovation that could allow vulnerable rural smallholder farmers and livestock keepers to benefit from insurance and thus reduce climate-related risk. Because index insurance is based on the realization of an outcome that cannot be influenced by insurers or policy holders (such as the amount and distribution of rainfall over a season), it has a relatively simple and transparent structure. This makes such products easier to administer and consequently more cost-effective to develop and trade. Indeed the success of several pilot programs in India and various countries in Africa and Latin America has proven the feasibility and affordability of such products. The initial pilot phase of the project, which included extensive field work and stakeholder consultation, was successful and is now complete. The research generated useful insights that have been used in the design of index-based livestock insurance (IBLI) products better targeted to the needs of pastoralists, the target clientele. An IBLI contract has been modelled, priced, tested, and sold. 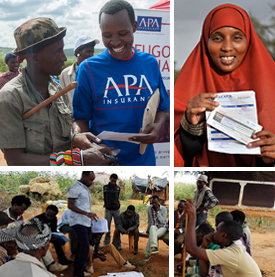 In October 2011, UAP Insurance Companyvand partners disbursed indemnity payments to policyholders in all five divisions of Marsabit District of Kenya, the first payouts since the launch of the pilot in January 2010. Drought triggered another payout in two divisions in March 2012. In July of 2012, IBLI was launched in the Borana zone of southern Ethiopia.